Just to clear the air for those unwary folks that aren't quite sure how to differentiate between a "HUD MANUFACTURED HOME & A MODULAR HOME I thought it might be time to dig through some of my archives and offer up important information that every real estate professional, lender, title & escrow company, contractor, home buyer, home seller and homeowner should know about before entering into any 'FACTORY BUILT' HOME deal. There's a lot of mis-information and/or dis-information in the real estate community on this subject and we just want to help set the record straight in an effort to prevent folks from becoming victims, or worse, getting involved with a messy, costly and time consuming lawsuit. The photo below is a "HUD MANUFACTURED HOME"
The photo to the left is a "MODULAR HOME"
"RV", "Park Model" and a "
In Part 3 w discussed the difference between a Pre HUD "MOBILEHOME"and a HUD "MANUFACTURED HOME". Now for the 4th Part in this series. No, your eyes are not deceiving you. What you see in the two photos above is exactly what you could see on a private lot or parcel in Anywhere, USA. Contrary to popular belief both a HUD Manufactured and Modular Home could very well go down the same assembly line in any factory and often times do. Both are available in myriad multiple sections and come in a variety of shape and sizes. Both have virtually the same choices of architectural detail i.e. curvilinear, pop outs, roof line options, T, L and even U shapes can be designed to meet just about any design challenge found in "SITE BUILT" homes. 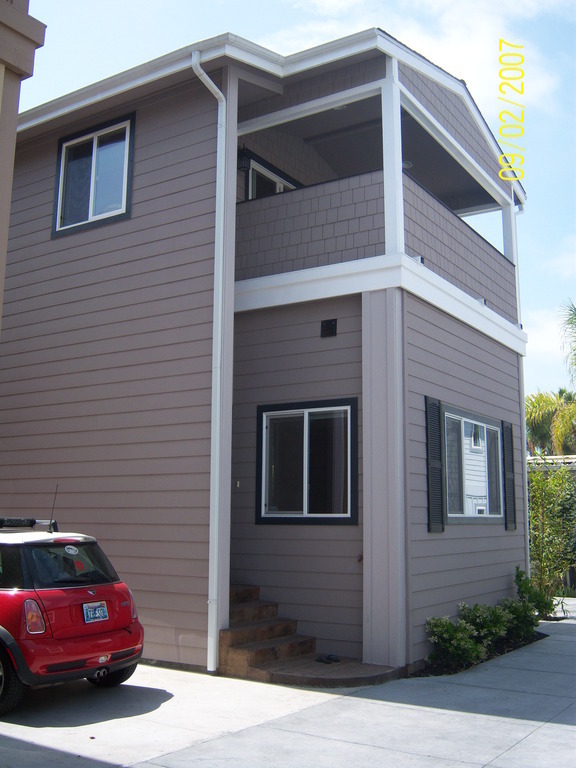 Both can have garages albeit HUD MANUFACTURED HOMES do require an alteration permit if the garage is to be attached. Or you can give it the appearance of being attached by unitizing it with flashing, siding and trim details. Both are available with the same array of flooring, wall & window covering, counter top, appliance and fixture choices throughout. Both can be prepped for tile, shake, composite, or any of the same roofing choices that site built homes use. Both can be sided with anything the designer chooses including stucco albeit the sections are shipped stucco ready and the stucco is applied on site. Both are available with drywall interiors. “Manufactured Homes” are single-family dwellings manufactured in a factory to preemptive federal construction standards. Available designs range from low priced single section homes known as “singlewides,” to upscale homes manufactured in several sections, and even multi-story homes. Shown at the right is a model designed for placement on a foundation with the garage constructed after the installation of the three-section home. HUD MH's are transported on their own running gear i.d. wheels, axles, towing tongue, hitch and running lights which are removed during the set up and installation. 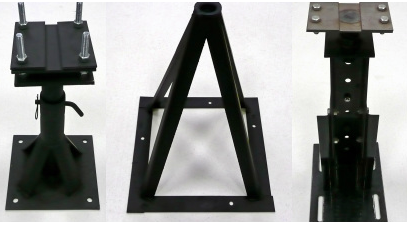 HUD MH's are set up on a series of steel pier and jack assemblies or concrete blocks with wood, plastic or poured in place concrete footings. 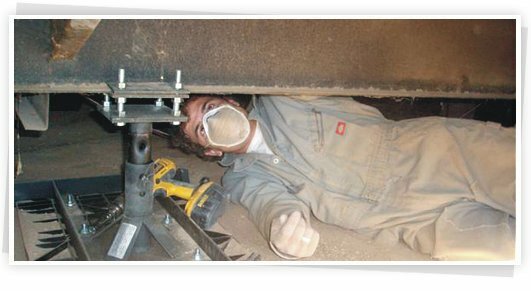 Today's California Housing and Community Development Departments (HCD), now requires that an "ENGINEERED TIE DOWN SYSTEM" (ETS) be installed on any new or reset MOBILE or MANUFACTURED HOME. Just to dispel the notion that HUD MANUFACTURED HOMES are only available in one story single family homes there are also “Multi-Unit Manufactured Housing”. "A 'multifamily manufactured home' is a structure manufactured in one or more transportable sections to form two or more dwelling units into a single structure when installed. 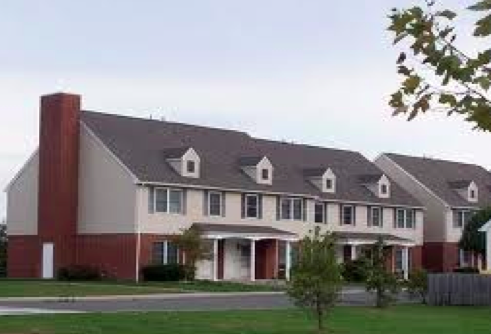 Multifamily manufactured homes may be used as a duplex, a dormitory, a hotel, efficiency units, or apartments, installed on a support system or foundation system. Depending on the situation, it may be required to comply with state and/or federal accessibility requirements." 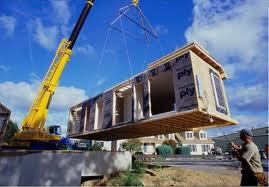 Modular homes are residences constructed entirely in factories and transported to their sites on flatbed trucks. They are built under controlled conditions, and must meet strict quality-control requirements before they are delivered. They arrive in a variety of sections and are generally installed on a poured in place continual footing and stem wall foundation including interior footings. 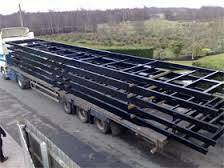 They are generally crane set or in some cases conveyed onto the foundations with a series of tracks and rollers if cranes are inaccessible or impractical. Cranes must meet certain guidelines i.e. spreader to boom ratio vs object weight and distance needed. They must conform to the same local, state and regional building codes as homes built on-site. albeit today's HUD MANUFACTURED HOMES are as well. They can be designed in multi-story (as much as several stories aka mid-rises), multi-family, residential or commercial apartments, condos, offices, mid-rise motels, etc. A study by FEMA found that modular homes withstood the wind and water from Hurricane Andrew better than most other homes in the area. 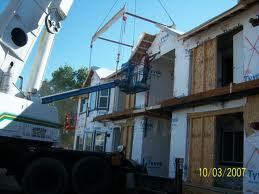 They take less time to construct than site-built homes, are more energy-efficient, and generally cost less. I have been tracking a lot of posts written and contributed by many real estate professionals on various blogging platforms from Active Rain to Linkedin as well as several publications and even in some audio visual commentary be it news related, informative documentary or advertorial in nature. We don't claim to have all the answers, information or knowledge. 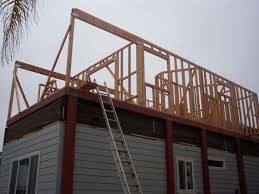 However, given the 3 decades W've been in this industry we thought we should put as much out there as possible for all to see in an effort to clear up many of the misnomers and misunderstandings that the real estate & construction professional and the lay person may have developed during the course of their research. FACTORY BUILT "Modular" & "Manufactured"
A little long no doubt Carol Williams but there's so much information on this subject nowadays I just wanted to share what I know with other members on AR so they won't become a victim of misinformation should they ever have the experience in dealing with one. Thanks! Yes, John, when people use terms like manufactured or modular I ask them if they know the difference so I can determine what they're actually talking about. Those terms are often erroneously used interchangeably. Thanks for the great info! My pleasure Carol Williams and I hope it helps. From your fingers to real estate agents' ears!! Not that I am even remotely deluded into thinking that a better understanding of two will make a difference in the way REALTORS list properties in MLS, but one can always hope. Excellent article and spot on. Good information to help describe the difference between modular and manufacturered homes, John. I will bookmark your post for future reference. Interesting Mary Yonkers Might have to use the bookmark above the address bar. John DL Arendsen This is very good report about the difference between a HUD manufactured home and a modular home. John DL Arendsen - I need to save this series for sure. I'd appreciate if you also include the links to previous posts - so as to make a complete set. Wow, there is a lot of information here. If I ever need to try and explain this to someone who asks I'll just send them the link. 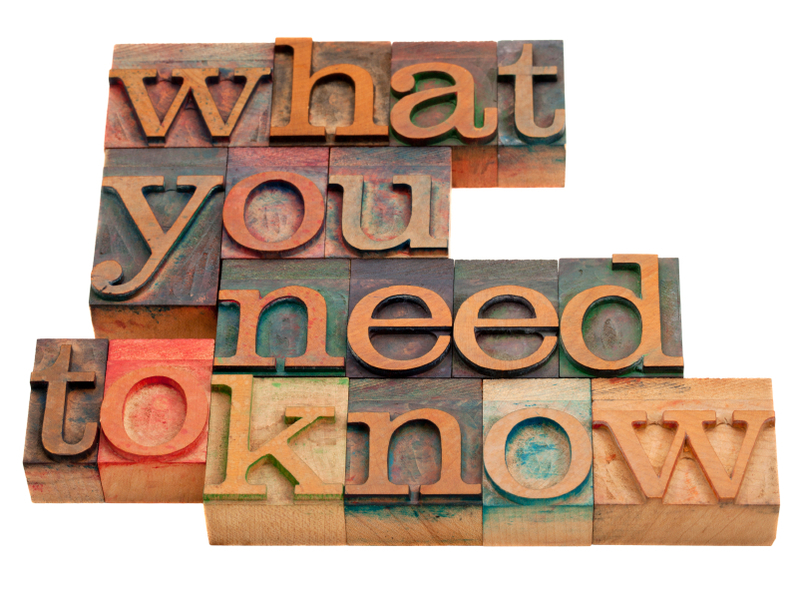 Glad you can use this info Gene Mundt, IL/WI Mortgage Originator - FHA/VA/Conv/Jumbo/Portfolio/Refi Just remember no two local ordaninances are alike. That stated, the HUD MFG Home falls under the Federal mandate and should be the same Nationwide. That was quite extensive and informative. I don't do any business with these kinds of homes but we are seeing more of them now in Oklahoma City. We would love to build a modular but haven't found the land yet. Still looking! Hang in there Sharon Tara there are big industry changes looming in the horizon. Time is on your side. In the St Louis area, we have modular homes, manufactured homes and mobile homes are the wheels. The homes often come off the SAME assembly line, but some have wheels that are meant to only be used one time to transport them to the site and others have wheels, which while they may never be used more than 1 time and may be removed when they are put on the site, are designed to be used more than one time. If the wheels were designed for more than 1 time use, the home is considered personal property (like a car) and depreciates rapidly (like a new car depreciates when it's driven off the dealer's lot), while the other is real property and can appreciate. Hmmm. Very interesting. I think I'll have to study that one a bit.